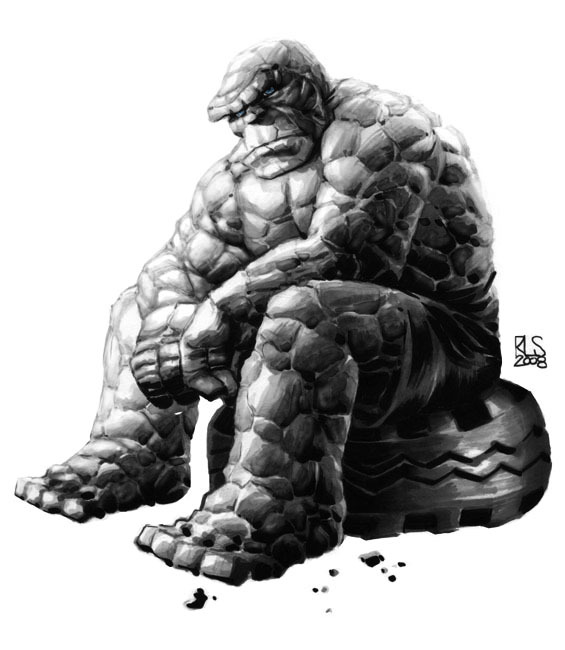 Ben Grimm The Thing has always been one of my favourite characters. In fact, the first american comic book I remember reading was a Fantastic Four issue (#167) with Thing fighting the Hulk on the St Louis Arch. Like all kids, I was fascinated by the fact that he was made of stone and always wondered how the change happened. This pic is inspired by that childhood thought. Edit: I don't know if everybody's seen this before but since we're still waiting for some Things to roll in I wanted to update this post with one of my favourite Things. Done with Copic markers with a healthy dose of the blender marker. DAMN, dude! This is...wow! Good job! Thanks Mike! Glad you like it. That is intense Ron!! Great job. So cool! I feel the strain of transformation. A tough shot to do and you nailed it! Love it. I love the angles, the motion, the emotion, its a great piece of work. Yet, call me greedy, but now I'm curious to see his surroundings at this moment in time. I love the pose! Looks great - you did Lee and Kirby proud! Man, this image is drawn with its own grisly sounds effects. Way to capture the shock and terror of the moment. Steve, Chris - I feel like I was innspired by the classic Steranko Hulk cover. It wasn't really a conscious thing but the feeling of shock and strain that the Steranko cover represents was what I tried to show in this pic. dave - Thanks. I don't really know where I would set this in. Also, I don't want to take away from the figure so I just let the background fade away. That's brilliant, Ron, I really like the chunks of rock flying off. Great pose and lighting. Thanks. 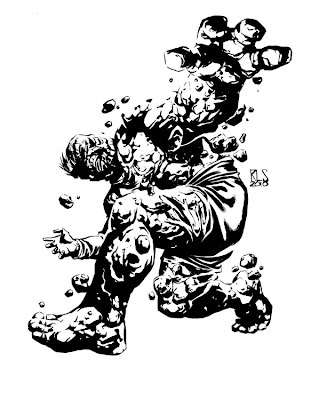 I imagined the transformation process as a huge WTF moment for him so he was constantly trying to shake off the stone that's trying to "invade" his body.